Pete will always be about as much of a musical treasure as anyone could be. His songs are so ubiquitous, so woven into the aural landscape, that they are almost anonymously indelible. Dar Williams recounts in concert about talking to Pete about “If I Had a Hammer”, and he would readily and easily credit Peter, Paul, and Mary for taking the song to the next level, almost as if he had no hand in it at all. Pete was the channel, and he celebrated the many varied lives that his songs and arrangements would take on as they moved through the world. There may be no one else who could claim a span of generations and a musical journey that saw so much, played for the likes of Eleanor Roosevelt and Martin Luther King, Jr. and Barack Obama (among SO many others), and inspired so many people around the world. My own favorite Pete Seeger song is probably “The Song of the World’s Last Whale,” being that I am a big fan of whales. Written in 1970, it was only recorded by Pete relatively recently, on At 89. It’s a more obscure song in his catalog, as a result of its newness. He had at least a hand in so many of the great songs we still sing, and will sing for generations to come. He may have considered himself merely an outlet for them, releasing them into the world to grow, change, be shared, to be sung and re-sung over and over again, but without him, the world would have had a little less justice, and a little less voice. 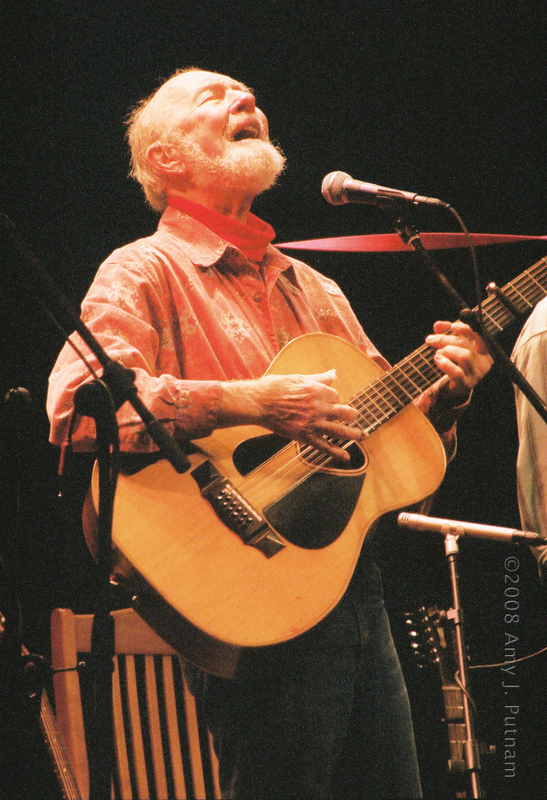 Much will be written about Pete, and you can get a good sense of his history from this article in the New York Times: Pete Seeger, Songwriter and Champion of Folk Music, Dies at 94. 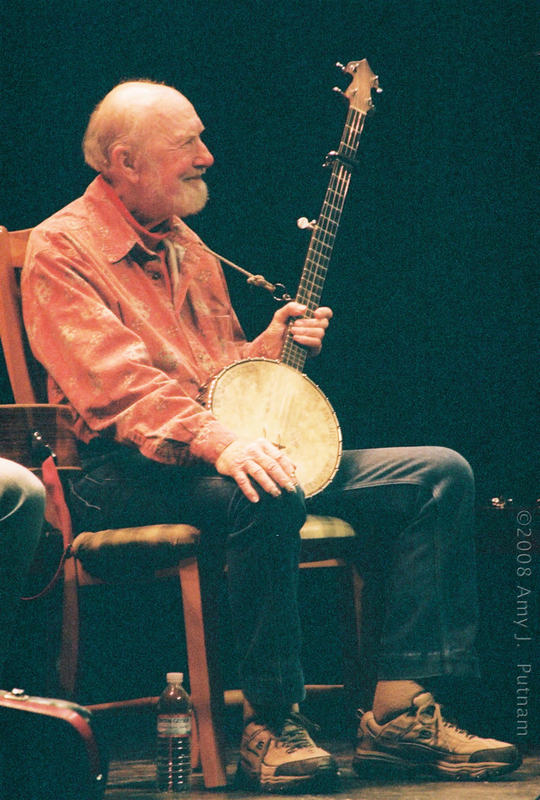 Another good read is Pete Seeger: This Man Surrounded Hate and Forced It to Surrender from The Nation. I think it is worth picking up any of his CDs, but I also recommend some of those where others sing his songs: Where Have All the Flowers Gone, The Songs of Pete Seeger, Vol 1; If I Had A Song: The Songs of Pete Seeger, Vol 2; Seeds: The Songs of Pete Seeger, Vol 3; and of course, Bruce Springsteen’s We Shall Overcome: The Seeger Sessions. This long and lanky guy who most often played a long and lanky 5 string banjo is irreplaceable, but the inspiration he leaves to generations of listeners and musicians alike to change the world one note, one word, one song, one action at a time will ensure the immortality of this gentle giant. “I think the world is going to be saved by millions of small things.” – PS. RIP, Pete, 1919-2014. I hope you and your beloved wife, Toshi, have reunited somewhere out there to keep the love going strong. Thanks for all of the stories and the songs. May we all now find our own voices and machines to lift up, to surround hate, and to force it to surrender. The best way we can honor Pete is to keep working to change the world into the place of peace and justice that he always knew it could be. This entry was posted in general musings and tagged Dar Williams, Guy Davis, Pete Seeger, Peter Paul and Mary, Tao Rodrriguez-Seeger. Bookmark the permalink. Great tribute! Thank you for writing such a wonderful piece.